DIAZO CAPILLARY FILM - Chromaline's economically priced, diazo based capillary film is a convenient, dependable performer with a reputation for producing trouble-free screens. The "workhorse" capillary film for use with UV, solvent-based and plastisol inks. 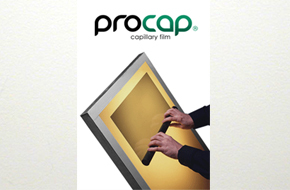 Pro/Capยฎ pre-sensitized capillary film for screen makers demanding high edge definition and reliable durability at a price value.